We are convinced that many people do not realize how widespread false teaching is in our day. They simply “go to church” or accept “church membership” and fail to have spiritual discernment regarding what is taught by the pastor, preacher, or priest. They just assume that all is well; otherwise, the denominational headquarters surely would not employ a particular person to represent their doctrine publicly. This is a woefully dangerous attitude to have, one that will lead us astray and into error. Some of this error may be exceedingly perilous and will lead both the teacher and the hearer to eternal condemnation! Jesus warned about the Pharisees of His day: Every plant which My heavenly Father did not plant shall be uprooted. Let them alone; they are blind guides of the blind. And if a blind man guides a blind man, both will fall into a pit (Matthew 15:13-14). Both the blind teacher as well as the blind hearer or student will fall into the spiritual pit and face the present and eternal consequences of false teaching. Many of our readers will recognize the name of William Barclay, the voluminous writer of Britain in the past generation. This teacher and writer was quite engaging and many have found his writings to be interesting and illustrative of Biblical teachings. He wrote small commentaries on the entire New Testament and many other books, a total of more than seventy! But not all of his writings are safe! Some of his teachings are subtle, false and dangerous! 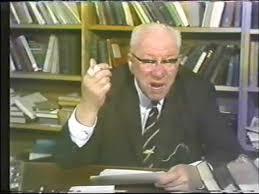 Harold Lindsell plainly says, “I do not think William Barclay was a Christian. . . . I cannot believe he was a Christian in the New Testament sense of the term.” What would make him write such a statement? What did Barclay really believe and what did he disbelieve? Let’s consider several points. Barclay admitted this unbelief in his own words: ”I do not think that we are intended to take the Virgin Birth literally. . . . I think we are clearly intended to take the story of the Virgin Birth as a parabolic, symbolic, pictorial, metaphorical method of carrying the unique relationship with God back to the very birth of Jesus.However, Scripture is quite clear about Jesus unique, miraculous birth, apart from any earthly father. Matthew explains: . . . when His mother Mary had been betrothed to Joseph, before they came together she was found to be with child by the Holy Spirit (1:18). The angel Gabriel said to Joseph, . . . the Child who has been conceived in her is of the Holy Spirit (v. 20).” See also Luke 1:26-38 for even further elaboration of this theme. Barclay was convinced that all would eventually be with God in heaven. He wrote, “I am a convinced universalist. I believe that in the end all men will be gathered into the love of God. . . . It is impossible to set limits to the grace of God. . . . I believe in the ultimate and complete triumph of God. . . . You can go to heaven via hell.” This flatly contradicts the words of our Lord who declared that the sinners on His left would hear His awesome words, ”Depart from Me, accursed ones, into the eternal fire which has been prepared for the devil and his angels” (Matthew 25:41). He went on to state quite plainly: “These will go away into eternal punishment, but the righteous into eternal life” (v. 46). See also 2 Thessalonians 1:7-10 and Revelation 20:11-15; 21:8. We know that the Word of God plainly tells us, “In the beginning God created the heavens and the earth” (Genesis 1:1). We further read that God used Christ Jesus to create everything, visible and invisible (Colossians 1:16-17). This would include the first two human beings—Adam and Eve. Jesus taught the historicity of these first two people in the Garden of Eden (Matthew 19:4-6) and Paul did likewise (Romans 5:14; 1 Corinthians 15:22, 47; 2 Corinthians 11:3; 1 Timothy 2:15). Evolution is plainly a lie and must be rejected as a false doctrine regardless of how popular it is in our day. Barclay, however, was an evolutionist: “All life, including man, came from pre-existing life. . . . within the universe itself we see a process of evolution in which man has come to be what he is after millions and millions of years of development. The long climb from the amoeba to the man may we not see design and purpose there?” Regardless of its popularity, evolution is a lie that must be rejected and will surely condemn those who hold to it. Scripture says that we may pray for all things within God’s will, but Barclay disagrees: “I do not think that it is right to pray for things. . . . I cannot think that it is right to pray for a new house or a new car or a new typewriter or even a new job. Jesus, however, taught that it was good to pray for material things, such as food: “Give us this day our daily bread” (Matthew 6:11). We may pray for anything that is within God’s will. So once again, Barclay deviates from the instructions on Scripture. While God is interested in the big things of life salvation and the gospel, He also is interested in our daily needs and concerns. To Barclay, Christ’s death merely demonstrated God’s love for mankind. He wrote, “It seemed to oppose God and Jesus, and to present me with a God who was out to punish me and a Jesus who was out to save me.” It is true that God demonstrated His love in the death of Christ (Romans 5:8), but it is also true that His death is presented in terms of propitiation, redemption, and reconciliation. “In this is love, not that we loved God, but that He loved us and sent His Son to be the propitiation for our sins” (1 John 4:10; cf. Romans 3:24-26; 5:6-11). We know that Scripture shows Jesus to be “God” in nature (John 1:1), and John the apostle confessed Him, “My Lord and my God” (20:28). But Barclay believed in a form of Adoptionism. He wrote, “Jesus Christ as a human being who had been taken up into divinity. . . . Jesus was a man into whom God came.” Adoptionism can be traced back to the second century when it was condemned and it should be condemned in our day as well. Jesus was and is both God and man, both deity and humanity (cf. Romans 1:2-4). We do know that tolerance is a quality in the Christian’s life. Paul says that we are to have an attitude that shows “tolerance for one another in love” (Ephesians 4:2). But we are not to tolerate false teachers and false teaching. We are to “turn away from” false teachers (Romans 16:17-18) and are to recognize those who reject the Biblical Christ as false prophets who have the spirit of antichrist (1 John 4:1-6). We must denounce and withdraw fellowship from those who present false teachings and unscriptural ways (Acts 20:28-31; 2 John 7-11). Barclay, however, tolerated those who must not be tolerated. He explains, “I am a very tolerant person, and the older I get the more tolerant I become. . . . I am not likely to condemn a man’s beliefs. If through them he has found his way to God, then that is his affair. I shall only think him wrong, if he refuses to extend to me the same sympathy that I extend to him. The one attitude that I believe to be wrong is the attitude of the man who believes that he has a monopoly of the truth and that there is no way to God but his way.” Barclay’s tolerance of everything but intolerance is far from the perspective of Christ and His apostles! Peter says that there is salvation only in Christ (Acts 4:12) and Jesus Himself declared, “I am the way, and the truth, and the life; no one comes to the Father but through Me” (John 14:6). We must never question the plain teaching of Scripture. The Bible is God’s inspired and authoritative Word (2 Timothy 3:15-17) and to question the Bible is to question God (cf. John 12:48). To reject God’s Word is to reject God. Whether we speak of creation or the flood of Noah, the virgin birth and sinlessness of Christ, the deity of Christ and the personality of the Holy Spirit, the atoning death of Christ and His resurrection, we must accept what is plainly revealed in God’s Word. What about Barclay? Consider the Biblical teaching on demons (cf. 1 Timothy 4:1-2). And what about Barclay? He wrote concerning demons: “It may seem fantastic to us; but the ancient peoples believed implicitly in demons. . . . Even if there are no such things as demons. . . .” The fact that Christ Himself accepted demons as actual malevolent spirits is cast aside by Barclay. If Jesus was and is the Son of God, then miracles are not only possible but they actually happened. Jesus said, “If I do not do the works of My Father, do not believe Me; but if I do them, though you do not believe Me, believe the works, so that you may know and understand that the Father is in Me, and I in the Father” (John 10:37-38). The Lord also said, “The very works that I do testify about Me, that the Father has sent Me” (5:36). Peter on Pentecost declared that Jesus was “a man attested to you by God with miracles and wonders and signs which God performed through Him” (Acts 2:22). Without doubt, Jesus performed miracles and these testified to His identity and power. We can learn something about a person by noting what he is, religiously. And this includes the matter of church membership and denominational devotion. In his earlier years, Barclay was a parish minister for this denomination of Presbyterian tradition. This, of course, is a full-fledged denomination, unscriptural in various practices and unlike the early community of Christ. For instance, while Barclay believed that Paul taught that baptism was adult baptism and baptism was instructed baptism and baptism was, if possible, baptism by immersion, he held membership in a church that continues to practice infant, uninstructed sprinkling. A liberal in theological terminology is one who denies many Biblical teachings and miracles. Liberal Protestantism is a modern movement that reinterprets the biblical and historical doctrines and practices of Christianity. Reluctant to endorse orthodox doctrines such as the virgin birth, the bodily resurrection of Jesus, the need for renewal by the Holy Spirit and the infallibility of the Bible, liberal Protestants are more interested in adapting religious ideas to modern culture and thought. With this background, Barclay wrote, “I suppose, if you wished to label me, you would call me a liberal.” He explains that as a liberal, belief in Scripture is unimportant in establishing unity between people: “Why is it that we must make so much of our differences and so little of our agreements? . . . One man condemns to outer darkness anyone who says that Moses did not write the Pentateuch, that the story of Jonah is not literally true, that maybe John the apostle was not the pen-man of the Fourth Gospel. Another has arrogant contempt for what he regards as academic ignorance. If only we were a little more sympathetic to each other, if only we would stop labeling each other heretic and outcast, truth would be better served, and the day be nearer when there will be one flock and one shepherd.” Thus, the object is unity regardless of what important Biblical facts and teachings are denied. This essay is meant not just to investigate an interesting and knowledgeable writer and speaker, but it is meant to help sharpen our powers of discernment. The Hebrew writer encourages his readers to consume the “solid food” of the Word and be mature people, who “because of practice have their senses trained to discern good and evil” (Hebrews 5:14). Have you become a student of the Word of God? Are you seeking to “accurately handle the word of truth” (2 Timothy 2:15)? Are you able to discern the untaught and unstable persons who “distort” the Scriptures (2 Peter 3:16)? Are you able to keep from being “carried away by the error of unprincipled men” (v. 17)? Are you able to see through the “smooth and flattering speech” of false teachers who “deceive the hearts of the unsuspecting” (Romans 16:18)? We encourage you not only to see through the false teachings and unbelief of William Barclay, but to have the knowledge and wisdom to see through the false teachings and deceptive ways of teachers and preachers on the radio, on the TV, or in magazines and books. False teachings abound in our day and we must keep from succumbing to their deceptive influence! Truth and truth alone will save and build us up in the faith. Harold Lindsell, The Bible in the Balance, pp. 45, 63. We take most of this from our book, Beware of False Teachers! Clive L. Rawlins, William Barclay, p. 547; Lindsell, The Battle for the Bible, pp. 154-155. William Barclay, A Spiritual Autobiography, pp. 58, 60, 61; Elmer G. Homrightausen, Barclay: Ecumenical Teacher of the Church, in R. D. Kerhahan, William Barclay: The Plain Uncommon Man, p. 137. A Spiritual Autobiography, p. 38. Quoted by Rawlins, pp. 377, 378, 387. A Spiritual Autobiography, p. 30. Barclay, Matthew, Vol. 1, pp. 328-329; cf. Mark, pp. 118-119. Matthew, Vol. 2, pp. 114-115. Terry L. Miethe, The Compact Dictionary of Doctrinal Words, p. 127. Barclay, Seen in the Passing, p. 153. William Barclay, A Spiritual Autobiography, pp. 58, 60, 61; Elmer G. Homrightausen, Barclay: Ecumenical Teacher of the Church, in R. D. Kerhahan, William Barclay: The Plain Uncommon Man, p. 137.